You Can Automate Your Online Support… There’s An App For That! Have you ever had to answer the same or similar questions about your products or service… more than once? Of course you have. 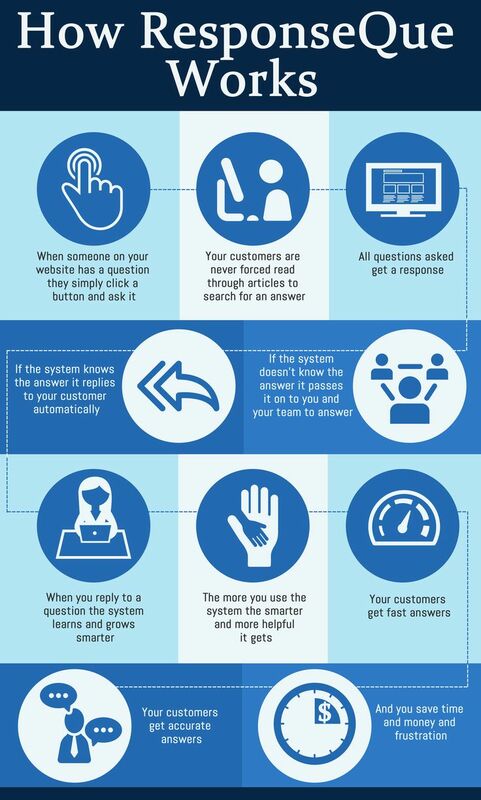 These are your frequently asked questions and together with junk/ spam messages your company receives this can add up to a good chunk of your time spent “providing customer service”. Here’s a little secret though… there’s an app for that. Allows your website visitors to ask questions where and when questions come up. Questions that come into the system get routed to a team message queue where you or your team can answer the question. Questions and answers then get indexed in the system along with meta data like what page it should be attached to (if any), whether or not the answer is valid only for a period of time and if the answer should be kept private or public. As you use the system you are actually teaching it how to answer automatically. Now when people come to your website and ask the same questions about your products or services they get fast quality answers based on your past interactions and similar conversations. ResponseQue is like cloning you and your best team members so that you can help more prospects and customers. Learn more about this innovative technology that allows small businesses with small teams to compete with larger companies with more resources. This simple app is changing the game for many forward thinking companies taking over the web.